We have been talking about how the Trout fishing season was about to get started, well it has started. Yesterday we had some amazing fishing with over 20 fish landed and released. Many of the trout were in the 2 to 5lb range with several fish over 5lbs. Sturgeon fishing remains challenging but we are seeing some nice fish, salmon fishing in Vancouver remains consistent. 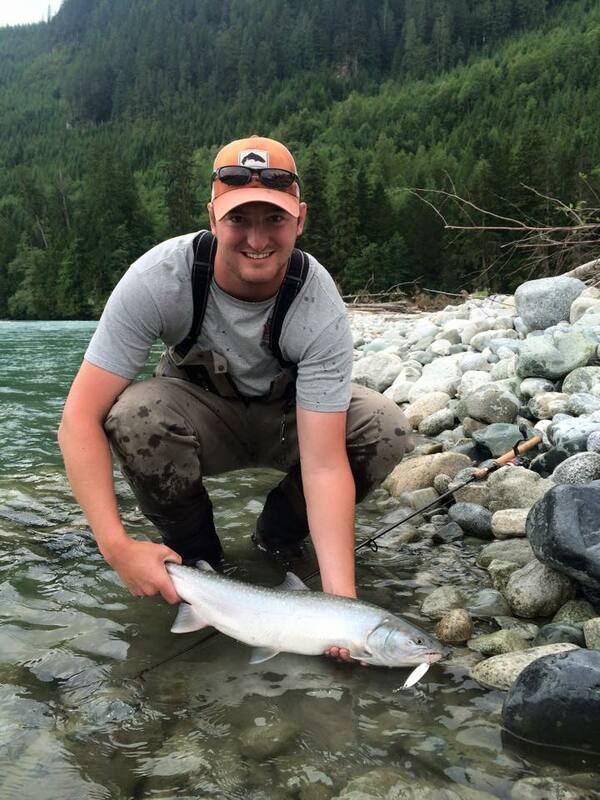 The Pitt River offers excellent opportunity for both fly anglers and light tackle spin fishing with spoons. This river changes its path on just about every heavy rainfall making the Pitt River one of the more challenging river to navigate and fish. This season the river is extremely challenging for running jet boats but once your past all the obstacles the amount of fishable water is much greater than in past years. 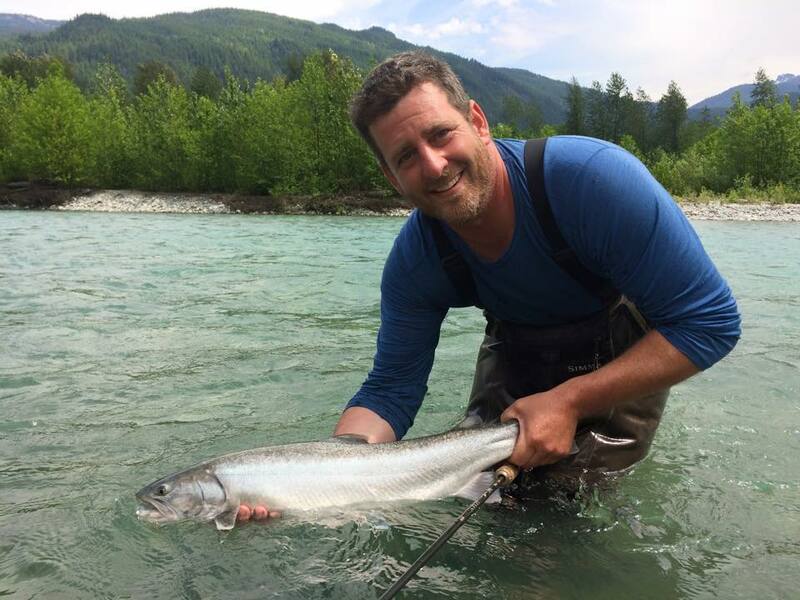 STS Guide Thomas Rutschmann has been guiding the Pitt along with Vic Carrao for the better part of 15 years, by far this one of our favorite times of year to fish the Pitt. Some of the techniques used to fish the Pitt are similar to steelhead but then again quite different. When casting flies the best method is a down and across presentation ensuring your fly is just tapping along the bottom or as close as you can get. The way to do this is to use a high density sink tip in the 3 to 4 rating. Once the fly touches bottom, just hold tight on the line for a second and fly will lift off again, a quick mend will send if back down placing the fly in the strike zone. Bouncing spoons along the bottom is a technique that we have developed over the years that produces some of the larger Bull Trout in the River system. Similar to fly fishing we cast the spoons upstream allowing it to sink to the bottom, once you feel the spoon hit the bottom, take up any slack and try to keep the spoon bouncing near the bottom by lifting and dropping your rod tip. The Spoon in the above pic is a Gibbs/Delta Croc Silver Hex, 2 1/4 inch, 3/8 oz. These along with gold or silver Ironhead spoons are some of the most productive spoons for Bull Trout but also salmon, cutthroat and rainbow trout. The key is choosing the right size for depth and speed of the water so that you’re not hitting bottom to quickly or not enough. 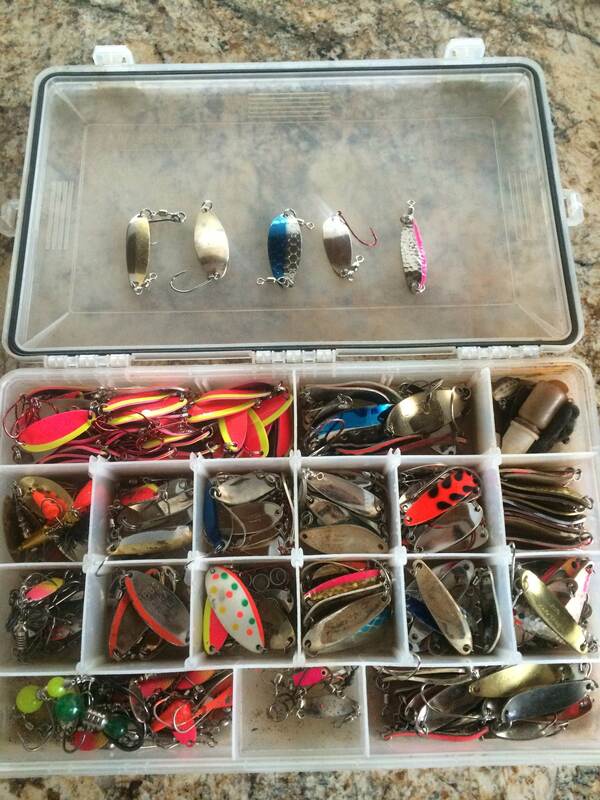 This is a look at Vic’s spoon box, pretty impressive selection of Gibbs/Delta Spoons. Ultra Lures, Ironhead and Crocs are the top producing spoons. 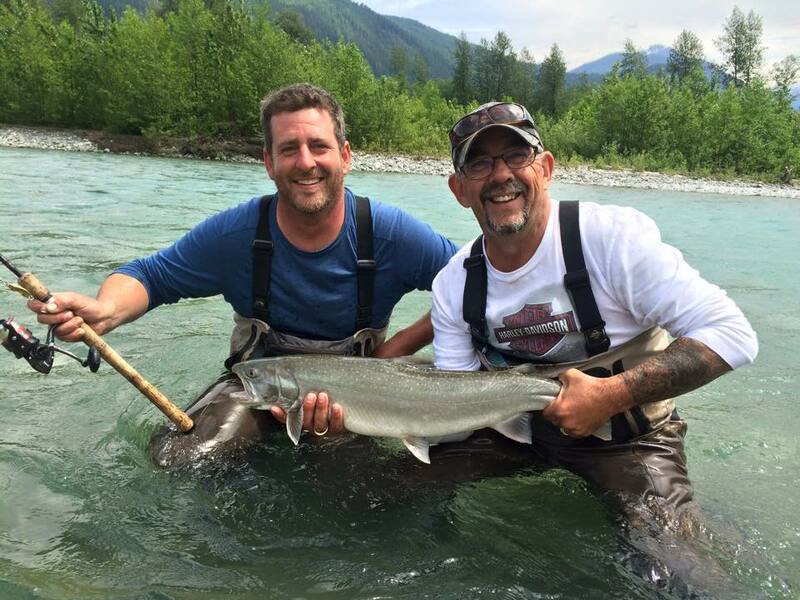 If you would like to get out with Vic or Thomas, please give us a call, we are offering Pitt River fly and light tackle spin fishing trips from now through until August 15 but now is the best time for the larger Bulls. 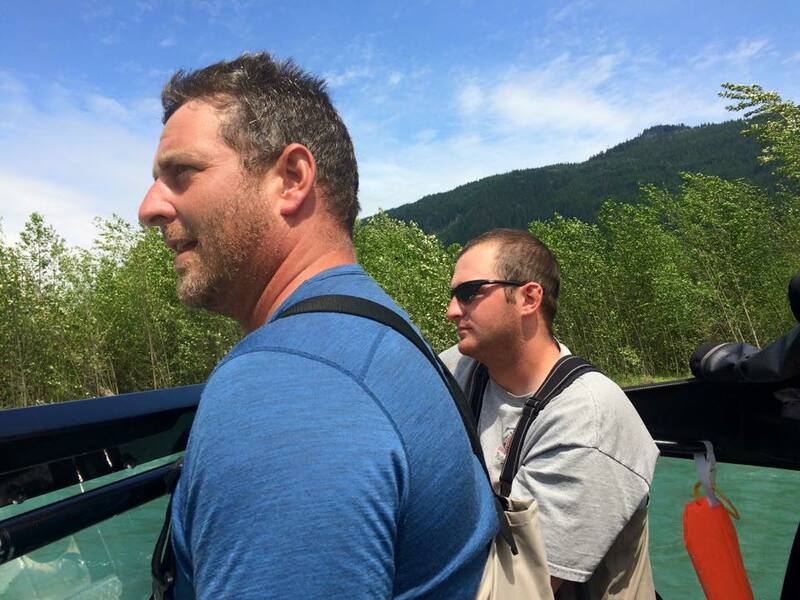 You are currently reading May 02 Fishing Report Update at Hells Gate Jet Boat Tours Blog.